Full-screen maps of the locations (left picture, reduced in size) show individual seats and allow to easily pick seats with the mouse. 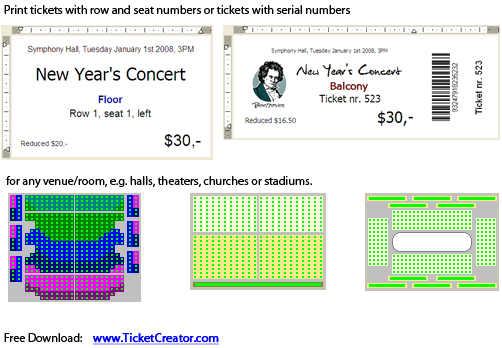 If you click on a seat or section further information on this seat (middle picture) or section (right picture) are displayed. 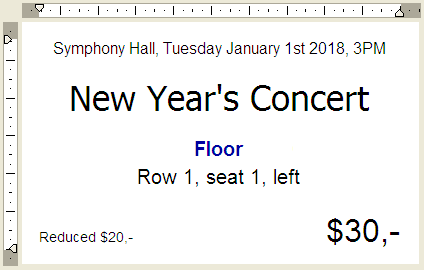 TicketCreator offers a wide rage of layout features to create attractive tickets, yet is easy to use. TicketCreator can also manage reservations. 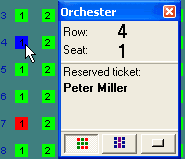 Reserved tickets are shown in blue on the seat map and display the reservation in the tool windows when clicked. Check also the video tutorials to see TicketCreator "in action".